We examined the topography of the sea floor from the perspective of plate tectonics in Chapter 10, but here we are going to take another look at the important features from an oceanographic perspective. The topography of the northern Atlantic Ocean is shown in Figure 18.2. 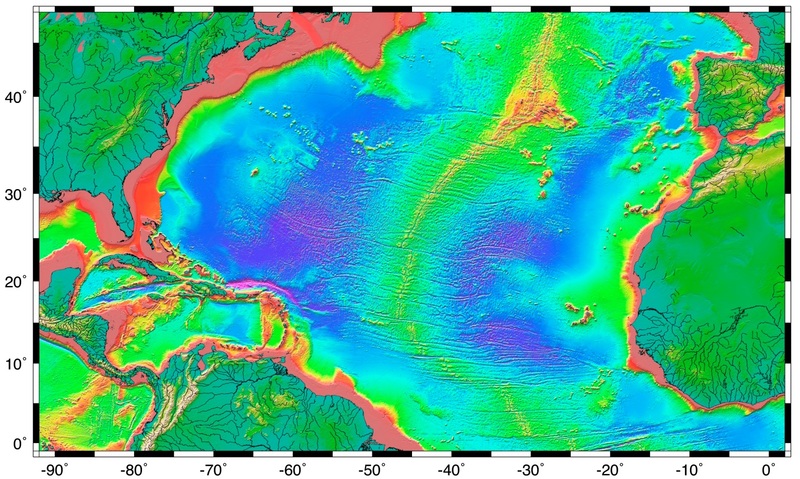 The important features are the extensive continental shelves less than 250 m deep (pink); the vast deep ocean plains between 4,000 and 6,000 m deep (light and dark blue); the mid-Atlantic ridge, in many areas shallower than 3,000 m; and the deep ocean trench north of Puerto Rico (8,600 m). A topographic profile of the Pacific Ocean floor between Japan and British Columbia is shown in Figure 18.3. Be careful when interpreting this diagram (and others like it), because in order to show the various features clearly the vertical axis is exaggerated, in this case by about 200 times. The floor of the Pacific, like those of the other oceans, is actually very flat, even in areas with seamounts or deep trenches. The vast sediment-covered abyssal plains of the oceans are much flatter than any similar-sized areas on the continents. 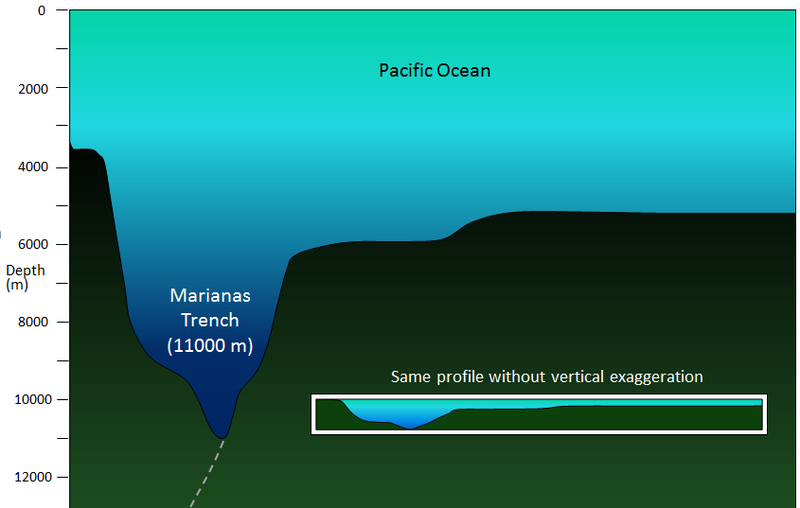 The deepest parts of the ocean are within the subduction trenches, and the deepest of these is the Marianas Trench in the southwestern Pacific (near Guam) at 11,000 m (Figure 18.5). There are other trenches in the southwestern Pacific that are over 10,000 m deep; the Japan Trench is over 9,000 m deep; and the Puerto Rico and Chile-Peru Trenches are over 8,000 m deep. Trenches that are relatively shallow tend to be that way because they have significant sediment infill. 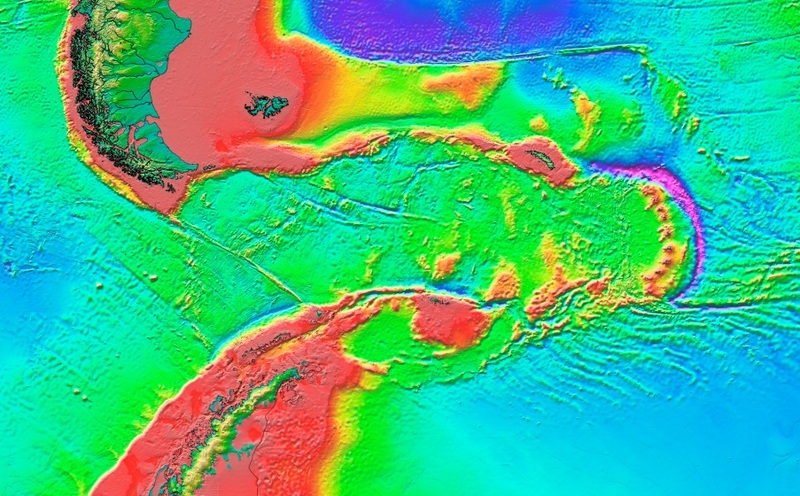 There is no recognizable trench along the subduction zone of the Juan de Fuca Plate because it has been filled with sediments from the Fraser and Columbia Rivers (or their ancient equivalents). (a) a continental shelf, (b) a continental slope, (c) a spreading ridge, (d) a subduction zone with a deep trench, (e) an abyssal plain, and (f) some isolated seamounts. 18.1 The Topography of the Sea Floor by Steven Earle is licensed under a Creative Commons Attribution 4.0 International License, except where otherwise noted.